DocsToBox is a functional application that lets you track paper files placed in storage. 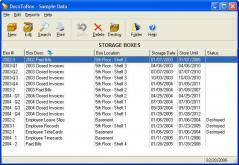 It provides a basic Search screen which you can use to quickly locate in which box a certain folder can be found. Also, you can define the contents of each file folder using customizable document types as well as the period of time the documents need to be stored before they can be shredded. Via the built-in data import wizard you can quickly load the lists of names you use when labeling file folders. On top of that, DocsToBox enables you to print various Avery style labels for your storage boxes and file folders, as well as customize the details written on the label.